COMDA today bears very little resemblance to the small team of hardworking members who helped found and establish the company back on May 31, 1973. As the demand for new, innovative products has increased over the years, COMDA has grown from it humble roots to be a leading producer and supplier of promotional products throughout North America. While wall calendars remain a central product of our business, we have developed core competencies in the design and production of pens, headwear, bags and drinkware, along with hundreds of other promotional giveaway items. Employees enjoy a team lunch! Our commitment to guaranteeing our customers 100% satisfaction also extends to creating a warm and welcoming work environment. Our growth would have been impossible without the support and teamwork of our most valued staff. As we commemorate our 44th Anniversary, we say thank you to our many loyal employees through our annual Employee Appreciation Day. We are proud that almost half of our employees have been with us for five years or more. In fact, 13% have over 20 years of experience and our top 2% started with COMDA over 30 years ago! COMDA brings the fun! 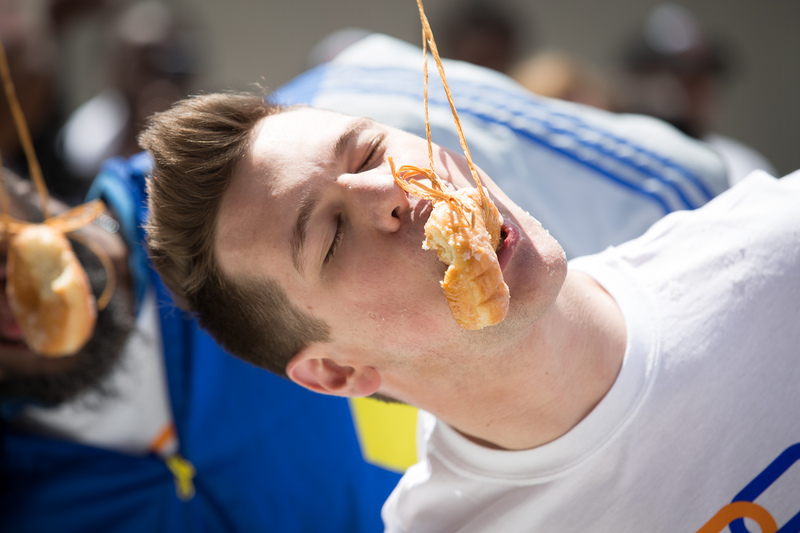 What better way to wrap up Employee Appreciation day than a donut eating contest?